After months and months of waiting, online heists are available today for GTA V.
Rockstar Games—the company behind the Grand Theft Auto series—have announced that the free update that contains Heists is now live on PlayStation Network and Xbox Live. It's around 4 GB download for new-gen systems, with last-gen users reporting that the file size is 1.2 GB. The multi-stage co-op missions require a four-player crew to play through the high-stakes theft and the Heist leader will need to have a rank of 12 or higher, along with a high-end apartment. Selecting 'Play Heist' from the 'Quick Job' menu on the in-game phone will trigger a call from GTA V's caper-planning character Lester. 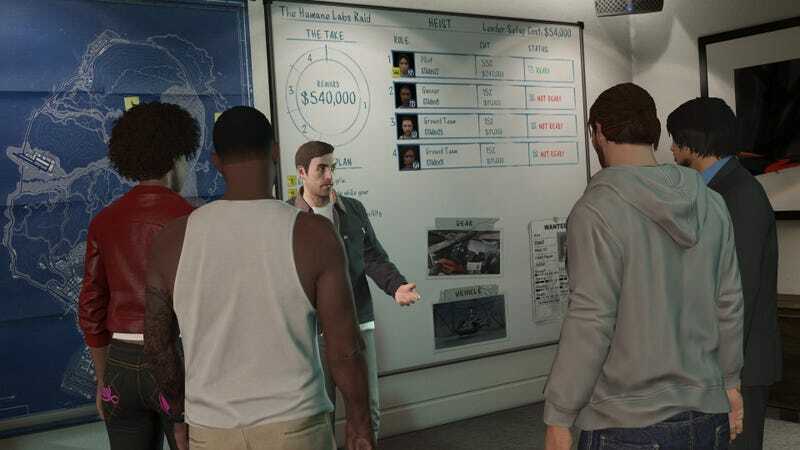 Leaders will have to front the set-up costs for the heists, used for getting equipment and NPCs to fill out specific roles. You can join a heist at any player rank, though, as long as they've completed the GTA Online tutorial. We'll have more on GTA V's heists in the coming days.